The State of Delaware encourages visitors by its tourist attractions such as parks, hotels, restaurants and landmarks on the one hand but their strong promotional tool is the state�s positive attitude toward gambling. For horse racing enthusiasts, Delaware offers harness racing, horse tracks and simulcasts as well as NASCAR. In addition, the state has a lottery and bingo parlors. In 1996, the state�s three racetracks received approval from a gaming legislation to install slot machines. Consequently, Delaware now has three casinos with amenities that are similar to those in Las Vegas and Atlantic City - click here to visit Delaware Gambling Forum. These slot machines are actually video lottery terminals since they are operated in conjunction with the Delaware lottery. In addition, they are different than terminals in other states because Delaware machines pay off in cash. Other games can be played on the video machines including video poker, video keno and video blackjack. Dover Downs race track, located in Dover, Delaware, initially opened its doors to the public on November 10, 1969. Horse racing was popular in the state for many years but because of the lottery and other gambling options, the industry was struggling financially by the early 1990�s. The Horse Racing Redevelopment Act was passed in 1994 with a view to saving the industry with revenue from slot machines which is said to have proven beneficial to the local and state economy. The sport of auto racing has retained its popularity. Dover International Speedway, the 91,000 square foot home of the NASCAR Winston Cup and the Busch and Craftsman Truck Series, host racing weekends in June and September which are well received by fans. Live harness racing is offered at the track from November through April and simulcast racing all year round. 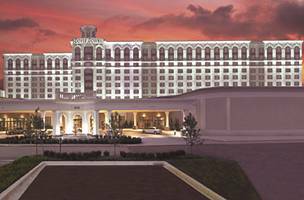 Dover Downs Hotel and Casino � which has a hotel with 500 rooms and nine restaurants, offers popular slot machines to their players ranging from one cent to one hundred dollars in their new slot parlors � the Terrace and the Promenade -with a total of 3,200 machines. The casino has recently added new progressive slot machines with jackpots over $1,000,000. Gamblers have the option of joining The Capital Club, which is a club for players that provides each one with a card to be used in the slot machines. Players receive a predetermined number of points for money put into the slot machines, which points can be redeemed for rewards such as meals, rooms, concert tickets, etc. There are two levels of club cards � the Gold for the average player and the Platinum for those who are bigger spenders. In addition to the perks mentioned, Platinum card holders also are entitled to free valet parking, free ATM service and access to the lounge area. Delaware Park Racetrack and Slots is located in Wilmington, Delaware. The facility features thoroughbred racing and has two tracks. The 2006 racing season will run from April 20 to November 19 with 136 live racing days. The casino is approximately 78,520 square feet and the property has eight restaurants. Hotel accommodations are conveniently located near the casino. Prior to the inception of slot machines at Delaware Park, the number of employees totaled 75. There are now 1,400 employees on the slot and hospitality team. The Players Reward Club offers free membership to slot players when they use their membership card to accrue points. This card can be used in both slot and tote machines. Comps are earned based on play and can be redeemed for food and beverages, gift shop merchandise and race book and valet parking. In addition, members receive quarterly rewards � again, based on play. A local resident won Delaware�s first MegaJackpot prize in the amount of $417,565 on a Wheel of Gold statewide progressive machine. Contrary to a number of other states that require winners of large cash prizes be identified in the media, Delaware allows their winners to remain anonymous if they so desire. Harrington Raceway & Casino (formerly Midway Slots and Simulcast) which is located on the Delaware State Fairgrounds, is open 363 days per year and is closed only on Christmas and Easter Sunday. The casino is about 45,000 square feet and contains 1,581 slot machines which are controlled by the Delaware Lottery. One of the most popular slots is �Kenny Rogers, the Gambler� with animation and music. The players club, the Winners Circle, is like similar clubs at other Delaware casinos: free to join and offers rewards to its members. Slot machine players insert their club cards into the machines when gambling and accrue a specified number of points for each dollar played. Regular card holders receive 20% discount at the casino�s upscale steakhouse, Gold card members receive 30% and Platinum members receive 40% off their bill. Current point rating period is from December 1, 2005 thru May 31, 2006. Players need to earn 12,500 points during this period to qualify for a Gold card and 25,000 points to qualify as a Platinum member for the July 1, 2006 thru December 31, 2006 period. For every $3 you play, you earn one point. As points are accrued, they can be redeemed for food and beverages and gifts at Midway as well as at a number of merchants and restaurants in the casino area. The Delaware lottery offers players a chance to win the Powerball, Multi-Win Lottery, Play 3, Play 4 and a number of instant-win games. Those who do not win have a second chance to enter their non-winning tickets for a chance to win a trip for two to Las Vegas. Slot machines were an American invention that forever revolutionized the world of gambling history in the latter portion of the 20th century. Thanks to virtual developments in the realm of secure online gambling, online slots are now changing the face of internet casinos everywhere. There is no way to provide a more vivid written illustration of the massive popularity of slots amongst the gambling community than to ask you to visualize yourself inside of a land casino. At the predominant positions located inside of the casino you will find an abundance of coin operated slot machines. The fact that inexperienced gamblers who possess no skill level can simply wager a minimal amount of money and strike it rich by winning a massive casino jackpot is clearly the most appealing factor involved with this great game. Unlike in Blackjack or Poker where skill level is an absolute must in order to win a significant amount of money, you only have to rely on lady luck to be on your side in order to be victorious.